Foundation for Prader-Willi Research Canada - Portfolio | A Full Service Marketing Agency based in Toronto, Canada - Karmatize Inc.
An agency dedicated to creating clean, unique & impressive marketing solutions. FPWR Canada is a dedicated, non-profit organization focused on finding a cure for Prader-Willi Syndrome. They host several fundraising events a year such as Walkathon's, Gala's, and medical conferences. "Karmatize did a great job with our website and they were very responsive in catering to our specific requirements." FPWR Canada had an outdated site which was failing to meet the organization’s objectives. They approached KARMAtize to develop a site that would increase memberships, fundraising and engagement to their events. They needed a consistent “look and feel” to eliminate confusion that existed between their offline and online promotional materials. Additionally, the organization’s content archive had ballooned over the past 5 years and included hundreds of photos, stories and videos that needed to be carefully indexed. With a large set of requirements and objectives, good planning was the key to success. We began by archiving all their content and developing a solid wireframe and sitemap that organized everything into clear categories. Since the organization had a diverse user base, we created a user-centered design that encompassed a broad and inclusive view of their audience. We developed a content management system that allowed internal organization members to add and modify content easily. Since the site’s launch, they have significantly increased their membership list and driven interest towards their events. 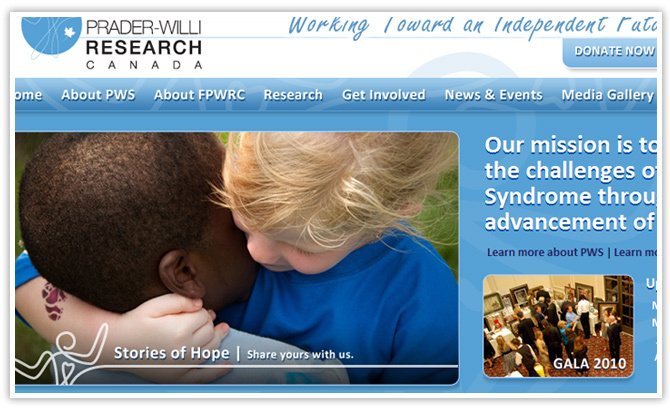 Today, fpwr.ca has become the main resource to find out about Prader-Willi and to contribute to finding a cure.